What Can You Do For The Land Of Israel? I wanted to take a few minutes this morning to emphasize how important our presence is in the land to the Israelis. (By ‘our’ I mean people living outside the land – whether Jew or Gentile.) So many people I spoke with feel alone, that the world doesn’t care. And what they see the world saying is that all the trouble in Israel is their fault. Now, I am saying we take the place of God. But aren’t we, as followers of the Messiah, called to be the hands and feet of Hashem in this world? Isn’t it part of our job to love his people and support them? Isn’t that what Paul emphasized? I suppose you know by now that Israel is suffering from the latest plague of terrorist attacks against its Jewish citizens. I also suppose you aren’t surprised that the news and social media are saying (again) it’s all Israel’s fault. Given the nature of my blog, I can only believe that most of my regular readers are pro-Israel and support the defense of the Jewish people against their aggressors. Ro, in the blog post I quoted from above, suggested that one of the things we can do in support of Israel is to visit the Land, just as she did a short time ago (and about which she blogged prolifically). So what can we do? Most of us aren’t in a position financially or in terms of our schedules, to hop a transatlantic flight and vacation in Israel for a couple of weeks. How else can we show our support? 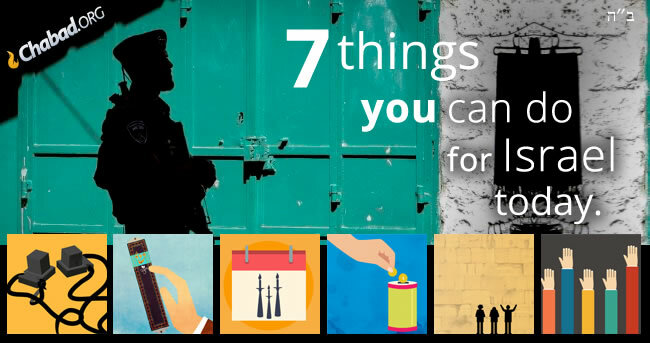 I read Ro’s blog when she originally published it to the web, but didn’t consider passing along her message until today when I read an article from the Chabad with the title 7 Things You Can Do for Israel. Some items on that list may seem pretty obscure so I’ll expand on them a bit. The “call to arms” is to help any Jewish man or boy over age 13 put on tefillin. That’s not something we non-Jews get much of an opportunity to do, nor is it something non-Jewish males typically perform (with a few exceptions, or so I’m told). Sharing the power of light is lighting the Shabbos and holiday candles and encouraging Jewish girls and women to do so. Again, not something most non-Jewish believers tend to perform and we typically aren’t in a position to suggest to Jews that they do so. The “Jewish security system” is the mezuzah. Because my wife is Jewish, we have a mezuzah attached to pretty much every doorway in our home (bathrooms are the exception). I’ve been told that when a Jew sells his or her home, they leave the mezuzot (plural of mezuzah) in place if another Jew is buying the home, and remove them if a non-Jew is the buyer (because it won’t be a Jewish home anymore). Praying for Israel is the first item on the list that’s freely accessible to any religious person, and we can certainly encourage others to pray for Israel and the Jewish people as well. The Chabad article has various links to charitable organizations anyone can donate to for the benefit of Jewish victims of terrorism. You can also do your own research and determine for yourself where you want to give your tzedakah (the word translates commonly as “charity” but also means “justice”). 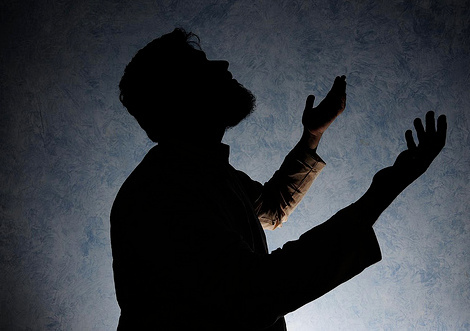 Nurturing your faith has to do with a Jewish person encouraging more religious observance and acts of faith with their own family and friends, specifically as it relates to a Jew’s connection to Israel. While we non-Jews don’t have the same connection to the Holy Land, it would be inaccurate to say we don’t have a connection at all. Hashem established Israel for the Jewish people but He also commanded the Jewish people to be a light to the world. That light comes most strongly from Israel and from our Rav, Yeshua (Jesus). Further, in His grace and mercy, Hashem has extended the promise of the resurrection, eternal life, and the Holy Spirit even to the Goyim, so how could we not be attached to Rav Yeshua, whose symbolic, sacrificial death and miraculous resurrection have opened the door to redemption for any who would repent and come to faith. We can encourage our own family and friends to embrace their faith in our Rav by expressing clear support of Israel in any manner we have available to us. No congregation that pays homage to Yeshua, which includes any Christian church, should fail to support the nation of the Jews in any way. Getting a letter is unique. Special Torah scrolls are being written in Israel, and the Chabad article says that any Jewish person may purchase a letter being written in a scroll. The way the form is set up, asking for the Jewish name of the person for whom the letter is being purchased, as well as the Jewish mother’s name and so on, I don’t think a non-Jew would be permitted to do this. On the other hand, we can certainly pass along this information to any Jewish people we know who we believe would be interested. The article finishes up with the suggestion that we pass this along in social media or anyplace else that Jewish people might see it and act. I’m writing all this not to make any non-Jew reading it feel discouraged by what they can’t do for Israel. After all, Chabad is in the business of drawing Jewish people to Jewish faith and observance, not Gentiles (though I suppose they’d have an opinion on what a Noahide could do). I’m writing today to show that we do have options in supporting the Land and the Jewish people. As Ro suggested, we could visit Israel and show our financial (by purchasing goods and services during our visit), emotional, and spiritual support. If we are in a position to do so, we can find some way to support any Jewish people in our local communities who we may know, to greater levels of Jewish observance. We can certainly pray, donate to Israeli charities helping terror victims, and encourage other believers to support Israel as an act of our faith (the last being a great way to educate others at your church or congregation). Non-Jewish disciples of Rav Yeshua call ourselves Christians, or sometimes believers, followers, or even “Messianic Gentiles.” We are who we are. We are not Jews and we are not Israel. But we can stand by Israel, even if we don’t know a single Jewish person, and do something to support a Land under attack, not just by human terrorism and world-wide public condemnation, but by ancient forces of spiritual evil. I don’t often write about “supernatural forces” but let’s face it. Our physical world is an extension of a spiritual reality and of powers and events long foretold by the Biblical prophets. 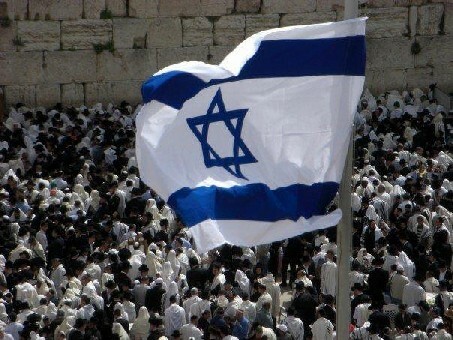 We know that bad things are coming for the Jewish people, for Israel, and ultimately for the whole world. This is as good a time as any to stand up and be counted on the side of good…the side of God. Tag. You’re it. Pass this along. This is just the short list. For more, read 54 Ways You Can Help Israel and find out which ones you can do…and then do them. Addendum: Just saw this link on Facebook about helping victims of terrorism and thought I’d share. 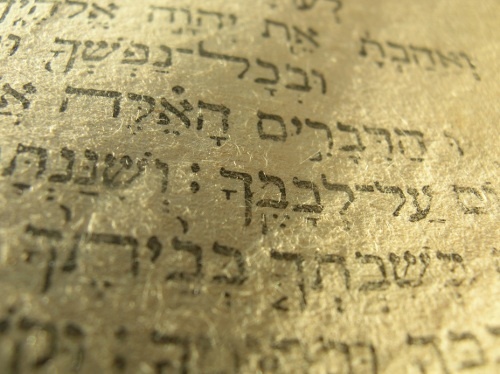 The Torah viewpoint is that the Almighty constantly creates the entire world and everything in it for each individual. This concept has the potential to give a person immense pleasure. Think about it for a moment. The Almighty — Creator and Sustainer of the universe — is constantly creating for you the sun, the moon, and all the other worldly phenomena. He is constantly bestowing upon you life, and every single second He supplies you with your needs. Thank you James, for the pingback. I wrote a rather long response, then it disappeared. Yikes! So I’ll try to be a bit briefer, but still cover the same points. While in Isreal, I witnessed one gentleman assisting another in the donning of tefillin. It was a precious sight, and I tried not to be obvious about watching. I stayed in the new city of Jerusalem (that shuts down on the Sabbath), and right before the Sabbath, a group of girls handed out Sabbath kits to everyone – especially tourists – encouraging us to celebrate the Sabbath. Some of the recipients were wearing crosses, so it was a bit obvious they weren’t Jewish. But that didn’t stop the girls. And I understand they do this every Friday. The kit contains two candles, matches, and the prayers. Not sure what organization they are with, but they are teens, so I am thinking this is not somethig they can afford to do on their own. While in Israel, I read a faith-filled article by Rabbi Lazer Brody which I shared on Facebook. It was a great way to respond to terrorism. I also read an article that said one of the surviving victims asked that Psalm 91 is prayed for him and others. This is something we, as Gentiles, can do also. As you pointed out, not everyone can hop on a jet and head to Israel, but those that are already planning to go, we can encourage them to stick with their plans. Last year, I was leading a tour that ended up canceling due to lack of participation. I feel that we can also write letters of encouragement. This is something a group of us did for our servicemen during the war, and we found out that more than the baby wipes, more than the chocolate, the notes letting them know they were not alone and forgotten gave them courage to press on. I also have a friend with family in Israel, and many friends. We are getting together this weekend to see how to quickly get organized to encourage the people of the land. There are a lot of older people who are not on social media, so have no clue that there are many of us outside the land that believe the Land belongs to them, that they have every right to be there, and we are praying for them. Now, many do not speak English, so we might have to connect with a local synagogue to translate, or give us some sentences that we can write on our own and give to them to deliver to the people in the Land. As Rabbi Brody pointed out in his article, “Hashem does everything for the best.” Perhaps bringing the local Gentile church and Jewish synagogues together to write letters of encouragement to the people of the land is part of his best. It has free services for short sentences, as well as more advanced ones for writing pages of stuff, working with verbs, and such…I use the service regularly, and subscribe for my classes in Biblical and Modern Hebrew, which continue despite my very slow rate of learning. :-). Get us an address to send letters to, and about what we should write…I for one would be happy to do this. Can someone explain to me how a “Secretary General, B’tSelem” (but all caps originally in the news, Israel) [I’m guessing this is Bethlehem, but I sure could be wrong] has the name HAGAI ELAD? He seems Jewish although I think this area is under Palestinian authority. and Jewish, because of his mother. @Marleen — B’tselem has nothing to do with the currently Arab-held town of Beit Lechem (Bethlehem) — at least not directly. B’tselem is a Jewish human-rights organization that often champions Arab causes because of the same kinds of views as held by liberal leftists elsewhere in the world. Sorry. He’s a leader of an activist organization, not of a city. And I should have noticed the name of the organization is probably House of Peace (translated to English), which is not Bethlehem (or house of bread, or house of meat from similar-ish Arabic). He was born in Haifa. He was in the West Bank in an interview I saw today, though. I obviously didn’t make sense of why he was saying what he was saying. I apologize. I won’t go into what he was saying. I’m sure someone here is aware of who he is. He seems infamous (or famous — depending — influential anyway). Also, he has a commonly recognizable Israeli last name that wasn’t being pronounced the way I’d notice the El. Someone maybe has already responded to my earlier bewilderment, but after James’ normal hours, such that I can’t see any such response at this time. No need to fill me in any further. Sorry. He’s a leader of an activist organization, not of a town or city. And I’m guessing the organization is “House of Peace” (not of bread, translated to English, or meat, from similar-ish Arabic), not Bethlehem. Someone may have responded (and I just can’t see it yet at this hour), or not. No need. His last name wasn’t being pronounce in a way that I noticed the “El” (although I should have noticed anyway when I typed it in). I won’t go into what he was saying in an interview. He was born in Haifa. He was in the West Bank, though, while being interviewed. @Marleen — No, B’tselem is not Beit Shalom, either. It means “in the image”, as in: “made in G-d’s Image”, as a reference to humans — who are, of course, thus deserving of “human rights”. Great idea, right? The only problem is the liberal leftist glasses through which the leaders of this organization view the world, thus distorting their sense of how limited are the rights that humans may actually claim and what privileges some of them may forfeit by behaving in sub-human fashion. They also thus fail to recognize who has been behaving in sub-human fashion and whom they have been attacking repeatedly, mercilessly, and unjustifiably. Okay, I’ll stop guessing at city and org names off the cuff. I was thinking for instance of the fact Solomon’s name (and the word peace) is pronounced in different ways [in just Jewish circles and with Arabic and other languages considered]. Maybe I’m wrong [: )] on that too. Yes, that is a great name.